Los Angeles County sheriff's deputies briefly pursued Monday a man flying a motorized glider, who they initially believed may have dropped contraband over Pitchess Detention Center in Castaic. 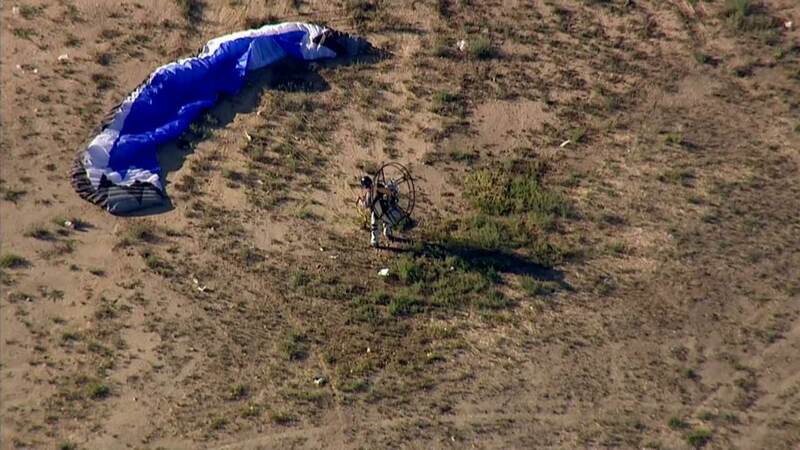 CASTAIC, Calif. -- Los Angeles County sheriff's deputies briefly pursued Monday a man flying a motorized paraglider, who they feared may have dropped contraband over Pitchess Detention Center in Castaic. Northridge resident Ron Nagin flew near the prison complex around 5:30 p.m. and was quickly chased down by a Los Angeles County Sheriff's Department helicopter for failing to yield. "We have several open compounds, so there was concern that somebody might be dropping contraband or there could be some crazy escape attempt. It was really hard to say," Los Angeles County Sheriff's Sgt. Brian Allen said. "At first I thought they were just looky-loos, just trying to investigate the sport, but I figured when they cut in front of me twice, I'd better turn around and land," Nagin said. By 6:05 p.m., the 67-year-old had landed at Tapia Canyon Paintball Center and authorities detained him without incident. Nagin, who has been power para-motoring for 15 years, made a mistake and didn't realize he flew so close to the prison. He told authorities that he didn't hear the helicopter's sirens and PA system ordering him to land because of a loud motor on the paraglider. He was later released without a citation, sheriff's officials said. A man flying a motorized glider led a Los Angeles County Sheriff's Department helicopter on a short chase over Castaic on Monday, Aug. 10, 2015. See photos.